This remarkable display of 1920s creative talents gets its vibrancy via contributions from an array of artisans including painters, architects and even glass artists, juxtaposing a creaky femme fatale story with sleek avant-garde style. 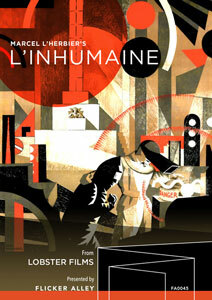 The l'inhumaine (inhuman woman) of the title is Claire Lescot, a wealthy opera singer who lives in a grand temple to art deco and cubism on the outskirts of Paris. There she surrounds herself with men who adore her, though she always remains cool to their attentions. She goes too far with the young engineer Einar Norsen (Jaque Catelain), the one suitor for whom she has true feelings, causing him to plunge his car off a cliff in romantic frustration. The incident causes a scandal, but this is the least of Lescot's worries as she finds that all is not as it appears. French opera singer Georgette Lablanc stars at the titular dangerous woman and was also a major backer for the film, providing half of the funding. At 55, Leblanc had already reached her professional peak; movie stardom was just another adventure. With a face like a head on Easter Island, she is grand, if not quite believable as a woman who inspires overwhelming lust in so many men. She's like Mae West in that she isn't as stunning as she thinks she is, but her confidence in her own appeal adds to her allure. The style of the film provides the substance. L'Inhumaine clearly isn't a showcase for acting talent or exploring new narrative forms. Lablanc in particular doesn't seem to know how to move in front of the camera, indulging in frequent chest heaving to express her emotions. The lack of nuance in the cast works in the film's favor though, adding to the sense of unease created by L'Herbier's unpredictable camerawork. They are not so much actors as figures to be adorned and moved through the creations of the various collaborators, oddly enhancing this portrait of an exciting, but chaotic modern world. Film noir typically evokes sharp-witted private dicks, smooth-talking gangsters and dark city streets. 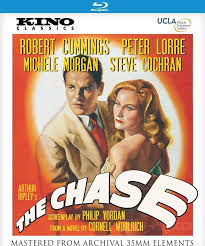 Dreaminess isn't regularly used to describe the genre but that is just what The Chase (1946) is, because this languid "wrong man" drama has the heady, slightly off-center feel of the surreal world of sleep. Robert Cummings is Chuck Scott, a scruffy veteran who is starving to death until he finds a billfold full of cash on the sidewalk. After borrowing a few bucks to buy breakfast and a cigar, he tracks down the owner of the wallet at his Florida mansion. Insisting on seeing the man himself, he is introduced to millionaire Eddie Roman (Steve Cochran), a psychopathic criminal who claims to be in the "entertainment business." Impressed with Chuck's honesty, Eddie immediately offers him a job as his chauffeur. The down-on-his-luck drifter is happy to take any job. Chuck is broke and appears to have been made at least somewhat emotionally numb by his war experiences. Unattached and aimless, he seems to think there is nothing in Eddie's world to which he would object, but that reserve is cracked when he meets the gangster's depressed wife Lorna (Michele Morgan). The Chase is both a psychological and physical chase. Eddie requires absolute control: whether in business or his personal life, but along with his mania for power is a delight in deciphering the desires and needs of others and exploiting their dreams. He is dangerously clever, with an otherworldly ability to anticipate the actions of those he targets. Like a slasher movie serial killer, he moves forward with steady confidence while his victims scurry away in fear, tripping over metaphorical tree roots, their failures filling him with delight. Cochran is the stand out here, in a performance that would doom him to typecasting as cruel villains. As his henchman, Lorre is sinister and self-amused, delighting in little tasks like subtly threatening a businessman in his boss' crosshairs, but always slightly irritated by Eddie's lack of caution. As the morally flexible Chuck, Cummings is appropriately seedy. While Chuck is the nominal hero, he is a complicated man. There is still good left in him after his traumatic wartime experiences, but he is a damaged soul. Morgan was not the first choice for the role of Lorna, but it is difficult to imagine any other actress pulling off the dreamy sadness and blunted joy she evokes here. She, above all the other stars, embodies the film's drifting, unreal feel. 23 Paces to Baker Street isn't necessarily a lost suspense classic, but it is entertaining and deserving of more attention. 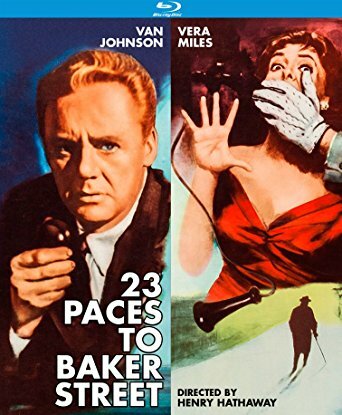 Starring Van Johnson, Vera Miles and Cecil Parker and directed by Henry Hathaway, it is a mystery that builds slowly but surely to a fascinating climax. Van Johnson stars as Phil Hannon, a playwright who has exiled himself to London after an accident that has left him with a life-altering disability. Bitter, and with too much time on his hands, he is alert and ready for action when he overhears a conversation in a pub that seems to point to a dangerous crime on the horizon. He searches for answers with the help of his estranged love Jean (Vera Miles), who has followed him across the ocean because she refuses to give up on the depressed writer, and his butler Bob (Cecil Parker), who gradually realizes how deeply he has fallen into his employer's obsession. The film proceeds slowly at first, but with consistent tension. While the police, and even Jean and Bob may not fully understand the danger unfolding, the audience always sees the emerging peril at hand. What that particular danger is stays unclear and here Hathaway shines, putting you in his character's shoes, making you wonder how far this should go before it becomes too dangerous. Once the threat becomes real, the action blows up and the momentum increases dramatically. Johnson, Miles and Parker are a pleasing trio. Their chemistry, and the plot they drive forward, is reminiscent of James Stewart, Grace Kelly and Thelma Ritter in Alfred Hitchcock's Rear Window (1954). Thanks to Parker though, the humor has a drier, more British feel. One of the great pleasures of 23 Paces to Baker Street is the glimpse it offers into 1950s London. In addition to a gorgeous opening sequence, there are fascinating scenes on the streets and in a now demolished department store. With fewer cars and people, and a slower pace of life, it is almost as if you are looking at a different city. Carol Reed's Night Train to Munich evinces the terror of a dawning war in a thriller which balances laughs, romance and action with remarkable ease. At this point in his career Reed had hit a certain rhythm, producing films that were polished, well-paced and always had emotional heft beneath a highly entertaining exterior. Margaret Lockwood is Anna Bomasch, the daughter of a wealthy Czechoslovakian scientist. While her father barely escapes the Gestapo for London in the months leading up to World War II, she is arrested and sent to a concentration camp for interrogation; she refuses to reveal where her father has gone. There she befriends Captain Karl Marsen (Paul Henreid). He presents himself to her as a passionately rebellious teacher but is actually there undercover, in an attempt to get her to lead the Nazis to her father. 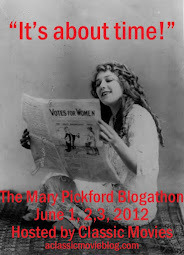 Rex Harrison is a soldier who helps her. 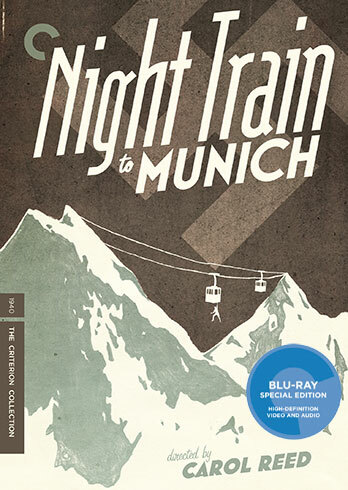 Given the relative innocence of the time, its remarkable how effectively Night Train to Munich captures the menace of what was to come. Though there were many unknowns in that year, the advance of danger was clear and Reed captures that feeling of doom in many ways, from the bullying actions of a Nazi officer, to the dawning terror in the glances between two Englishmen who realize all the dry jokes in the world can not stop the upheaval to come. Harrison, Lockwood and Henreid (here credited by his real name von Henreid) star in early roles, each similarly perched on the edge of their eventual greatness. Compared to his most famous parts, Harrison is almost pretty here, looking young, thin and much more mischievous. Two years after an equally nervy performance as the heroine in The Lady Vanishes, Lockwood once again possesses the perfect mix of elegance and grit, making it plausible that this daughter of wealth could manage such a great upheaval of her plush life. Henreid also ably manages a contradictory persona, exuding matinee idol eroticism while also projecting an aura of menace. 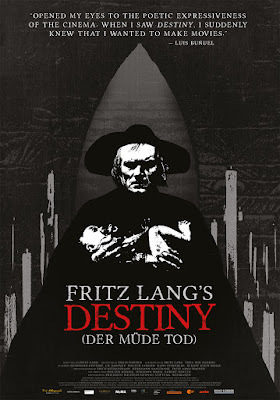 Destiny is German director Fritz Lang's first major production and a worthy companion to his other silent era triumphs, the Die Nibelungen (1924) films and Metropolis (1927). It awakened filmmakers Luis Bunuel and Alfred Hitchcock to the thrills and artistic beauty of film and its special effects so impressed Douglas Fairbanks that he bought the rights in order to hold back the release of the film in the United States until he could imitate them for The Thief of Bagdad (1924). 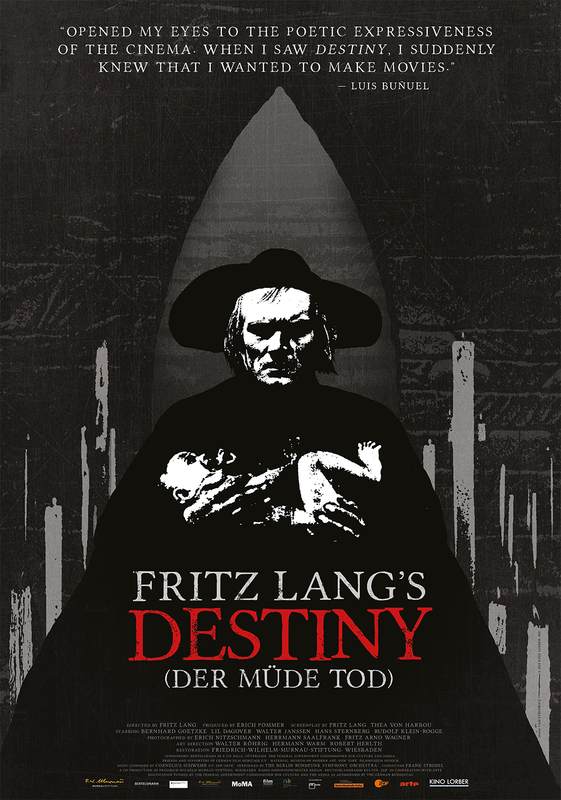 In a dark tale that foreshadows the tone of Lang's work, Destiny is the story of a woman (Lil Dagover) who goes head-to-head with death (Bernhard Goetzke) in an attempt to win back her fiance (Walter Janssen), who he has taken as they enjoy a romantic afternoon at a pub. As the title suggests, Death is rather weary of claiming souls and he gives the grieving woman three chances to win back her lover. In a trio of scenarios, she is tasked with saving one of the lives on the Grim Reaper's list for imminent disposal. If she outwits Death one time, she gets her man back. These three elaborate scenarios are the central action of the film. In each of them actors from the framing story join the two lovers and Death in what unfolds as a series of parallel worlds where the power of love is continually tested. With elaborate settings, and what the opening credits claim to be authentic costumes and artifacts, Lang stages his stories in an Arabian Nights-style Persia, Venice during the Renaissance and ancient China. In these tales the players enact highly exoticized and caricatured versions of the people of these cultures, often playing them for laughs, but these amusements do little to mask the darkness, violence and doom at the core of the action. With his gaunt cheeks and oddly blank eyes, which give off the appearance of lacking pupils, Death looks frightening, but entirely over it all. Weary Death is the perfect title for this scenario. In his lair, surrounded by flickering candles which symbolize with eerie simplicity the living souls he will someday claim, he is motionless and emotionless, with a rigid expression of disillusionment that looks carved into his skull. He finds no joy in extinguishing lives, as he demonstrates in a chilling scene; a candle flame turns into a baby which he briefly holds with a jaded expression before it vanishes into the after world. The special effects are among Destiny's most spellbinding elements, and still enchant nearly one hundred years later. You can see the bits Fairbanks borrowed for his own epic, including the way a flying carpet is approached and a flying scroll that looks much like a similarly lively rope in The Thief of Baghdad. Other effects were already fairly common at the time; creating transparent figures and making people appear out of thin air are elegantly executed and used to satisfyingly unsettling effect.